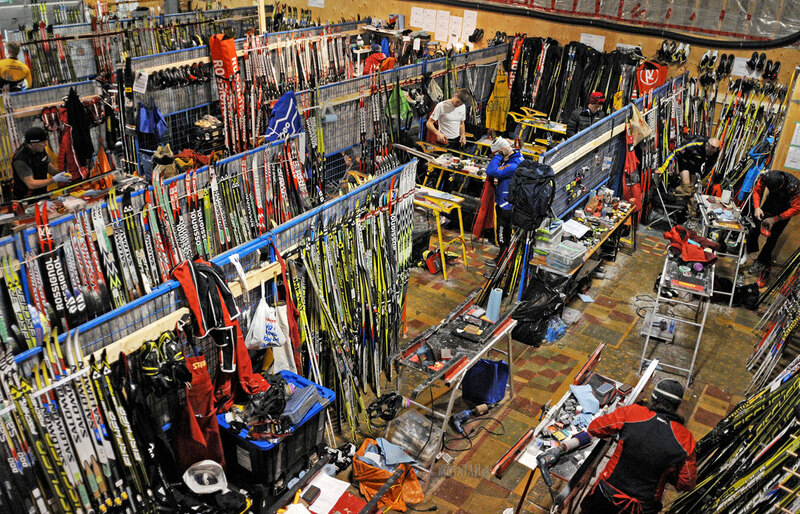 WAX ROOM ABUZZ – The 2016 Haywood National drew almost 600 skiers, coaches and support staff from across Canada to Whitehorse. The wax room up at Mount McIntyre was abuzz throughout the championships. In hopes of hosting the national cross country ski championships two years from now, the Whitehorse Cross Country Ski Club is planning substantial upgrades to its trails. Club manager Corinna Warren said this morning the International Ski Federation has changed its standards for hosting major events like the Haywood Nationals. The club hosted the Haywood Nationals in 2016 and in 2010 but the FIS has since changed the standards. “Our certification is expiring next year so we would not be able to apply for this race,” Warren said. She said while there will be quite a bit of work required to come into compliance with the new standards, the work only covers about 10 per cent of the Mount McIntyre trail network. Warren explained the new standards, for instance, establish wider trail widths for sections where the grade of the slope is a certain degree. In addition to the regular volunteer work that will be required, there will need to be some people hired and other expenses such as moving the location of light poles along certain sections of trail, she explained. Warren estimated the total project cost will be in the neighbourhood of $200,000, including in-kind contributions from local business and organizations. Additional funding will be sought through grants from the Community Development Fund and such, she explained. For the Whitehorse club, she said, hosting the Haywood Championships is a means of promoting the sport in the community, she said. Warren said an economic impact study by Sport Yukon showed the 2016 championships resulted in a $2 million injection into the local economy. It’s estimated there were 480 skiers, another 80 or so coaches and support staff and somewhere between 100 and 200 family members who visited Whitehorse for the championships, she said. The club has filed a project proposal with the Yukon Environmental and Socio-economic Assessment Board. Members of the public have until Feb. 19 to provide comments. The proposal calls for widening 9.4 kilometres of trail from an average of five metres wide to six metres for 6.35 kilometres, to 7.5 metres along 1.6 kilometres and to nine metres along 1.45 kilometres. The proposal calls for 81 metres of new trail, as well as relocating light poles along some sections. The organic waste will be chipped and used as fill and cover along the trails and timber will be stacked and made available to the public, says the proposal. Before the upgrades begin, I wonder if now would be a good time to consider relocating the WCCSC? The City is Looking for more residential land, and most of the land the clubs trails occupy would be great for residential. The City could look at relocating the club and trails to the Sima area, which has many advantages including higher elevation, more snow than the current location, snowmaking infrastructure in place at Sima, and the new trails could be designed to include all relevant standards. The new facility could be custom desiged for XC skiing rather than being shoe horned into a curling facility. City gets more residential lots, club gets a better facility.